The Partido Comunista de España (PCE - Communist Party of Spain) was founded in 14 November 1921 as the merger of the Partido Comunista Español (PCO - Spanish Communist Party; established in April 1920) and of the Partido Comunista Obrero (Workers' Communist Party; established in April 1921). Antonio García Quejido (1856-1927), an historical worker's leader of the PCO, was elected the first secretary general of the PCE in March 1922. The PCE was declared illegal in December 1923 in the aftermath of Miguel Primo de Rivera (1870-1930)'s coup held on 13 September 1923; its direction was dismantled and its membership reduced to a few hundreds of militants. Re-established in 1925 under the leadership of José Bullejos (1899-1975), the PCE experienced a period of conflict and exclusions; this did not prevent the party to rise again, following the miners' strikes in Asturias and Biscay and the rallying of the Seville branch of the Confederación Nacional del Trabajo (CNT) union. This resulted in another dismantling of the party in 1928 and in the closure of its review La Antorcha (The Torch). Revived during the so-called Pamplona Conference, which was actually celebrated in Bilbao in 1930, and publishing the weekly Mundo Obrera (Worker's World), the PCE considered the proclamation of the Spanish Republic on 14 April 1931 as an abuse of the working class and called instead for a worker and peasant's republic. After Bullejos' sacking in 1932, the PCE adopted a less extremist posture; its membership increased from hardly one thousand in April 1931 to 8,800 in December 1931, 12,000-15,000 in December 1932 and 20,000 in October 1934. 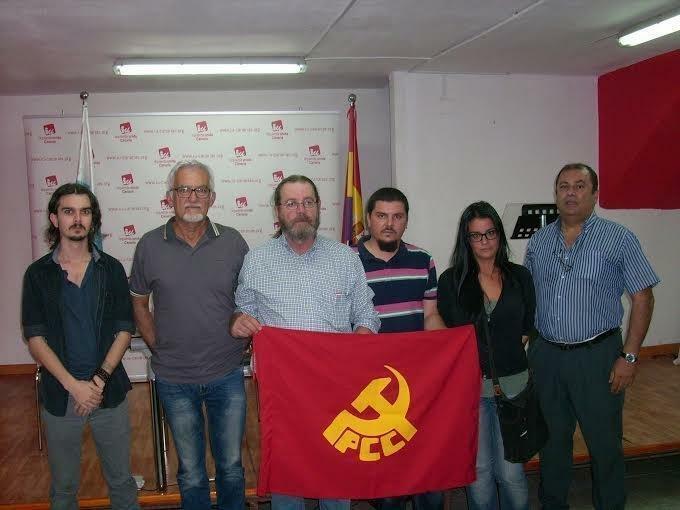 The youth branch, Unión de Juventudes Comunistas (Union of Communist Youth), significantly contributed to the reorganization of the PCE, once counting more members than the party itself. In the 4th Congress of the PCE, held in March 1932 in Seville, more than half the delegates came from Andalusia with Seville as the most active nucleus; the other most important nuclei were Asturias, Biscay and Madrid. The party was divided into regional federations and counted another two national sections, the Partit Comunista de Catalunya (Communist Party of Catalonia) and the Partido Comunista de Euskadi (Communist Party of the Basque Country). In November 1933, Cayetano Bolívar (1897-1939) won the first seat of representative for the PCE when leading a unified leftist list in Málaga, prefiguring the Frente Popular (People's Front). The idealization of USSR, known as "la Casa" (the House), and unconditional support to its ideology, explained the increased popularity of the PCE, even beyond communist militants. The party also incorporated collectives such as the Partido Social Revolucionario (Revolutionary Social Party) and Izquierda Revolucionaria y Antiimperialista (Revolutionary and Anti-imperialist Left). The PCE counted several affiliated organizations, such as Mujeres Contra la Guerra y el Fascismo (Women Against War and Fascism), Amigos de la URSS (Friends of USSR), the Socorro Rojo Internacional (International Red Help), and the Asociación de Escritores y Artistas Revolucionarios (Association of Revolutionary Writers and Artists). Repressed once again after the Revolutionary General Strike (5-19 October 1934), the PCE sought an alliance with the Partido Socialista Obrero Español (PSOE - Spanish Socialist Worker's Party); in July 1935, José Díaz (1895-1942) called for a Bloque Popular (People's Bloc) or Concentración Popular Antifascista (Antifascist People's Grouping), whose program mixed radical (confiscation without compensation of the possessions of the landlords and of the church, "liberation of the peoples oppressed by the Spanish imperialism") and moderate (amnesty, improvement of the working conditions) proposals. The victory of the Frente Popular in the general elections held in February 1936 offered 17 representatives to the PCE. Membership raised from 17,300 in December 1935 to 30,000 in February 1936 to some 100,000 in June 1936. Most of the new members came from rural areas, one third of them being women. The party significantly gained popularity in Andalusia, Levante, Extremadura, Asturias and Madrid. When the military uprising against the Republic broke out, the PCE presented itself as the leader of the unified anti-fascist front. The enlarged plenum of the party, held in Valencia in March 1937, reaffirmed its objective of democratic revolution and a program that privileged military force and the unity of the Republican front against any attempt of social change. After the German and Italian interventions, the PCE called for a revolutionary national war and the defense of the country's independence. The support of Soviet Union and the set up of the International Brigades, contrasting with the lack of involvement of the western democratic states, increased the prestige of the PCE. During the siege of Madrid, Dolores Ibárruri (1895-1989), aka la Pasionaria, addressed on 19 July 1936 the crowd from the balcony of the Ministry of the Interior, delivering the famous "¡No pasarán!" (They shall not pass). In September 1936, the PCE entered the government led by Francisco Largo Caballero (1869-1946), which was a primer in a western democracy, and in local governing bodies of Madrid, Catalonia, Basque Country, and Asturias and León. The party soon criticized Largo Caballero, the situation being aggravated by the armed struggle between different factions that claimed hundreds of lives in Barcelona in May 1937. After the fall of Largo Caballero, the PCE was part of all the governments led by Juan Negrín (1892-1956) until the collapse of the Spanish Republic. At the end of the Civil War in 1939, the PCE was totally disorganized; most of its leaders exiled to France, USSR, North Africa or Mexico. In Spain, repressions was harsh, with summon executions and jailing. Not intended to become the "emigration's party", the PCE re-emerged inside jails. Matilde Landa (1904-1942) was appointed in March 1939 leader of the clandestine organization of the party in Madrid. Arrested, she committed suicide in her jail. Heriberto Quiñones (1907-1942), a Comintern agent, proclaimed himself in April 1941 "responsible and national organizer of the PCE"; he was arrested in December 1941 and shot in October 1942. France became the home of the National Union, proposed in 1943 in Montauban; the Supreme Government of National Union was set up in September 1943. In October 1944, an attempt of military reconquest of the Arán valley was cancelled at the last time, which caused another internal conflict and the expelling of the leader of the PCE in France, Jesús Monzón (1910-1973). Guerilla organized from France failed to destabilize Franco's regime and triggered a violent repression; in 1948, the PCE gave up military struggle and adopted a strategy of infiltration of the institutions, especially workers' unions, as recommended in 1948 by Stalin during a secret meeting with the party's leaders. The PCE was declared illegal in September 1950, which forced its leaders to exile to Prague and to keep contact, via Paris, with the clandestine organization led in Spain by Santiago Carrillo (1915-2012). The 5th Congress of the PCE, held in Prague in 1954, consolidated the re-organization of the party. In 1956, the PCE initiated a strategy of "open arms" to all the opponents to Francoism and searched alliances with new opposition groups that had just emerged, such as the Asociación Socialista Universitaria (ASU - University Socialist Association) and the Frente de Liberación Popular (FLP - People's Liberation Front); in June, the political bureau of the party proposed the National Reconciliation. This orientation was maintained by the 6th Congress of the party, led in December 1959 - January 1960, which elected Santiago Carrillo as the successor of Dolores Ibárruri; the Bureau was renamed to Executive Committee to emphasize the national orientation of the party. When the 8th Congress was held in 1972, the PCE appeared to be the sole significant anti-Francoist party in Spain. The last years of the Francoist regime were characterized by the rise of social movements, where political claims were superimposed to claims by workers and the lowest classes hit by the economical crisis. The unrest favored the increase of the PCE, whose membership increased from 15,000 in 1975 to 150,000 in April 1977, when the party was legalized, and to 200,000 in June 1977. The review Mundo Obrero, weekly since 1976, was sold to 150,000 copies. The Democratic Government, proposed in July 1974 by the PCE, did not rally all the anti-Francoist parties; the PSOE, the Christian Democrats and the Basque nationalists proposed in June 1975 a rival project, the Platform of Democratic Convergence. The two projects were merged in February 1976, after Carrillo had secretly returned to Spain. The PCE abandoned its traditional rhetoric, accepting "the opening of negotiations with the elements declared reformists and with the representatives of the Armed Forces and of the Church" to establish a transition government. The party called for abstaining to vote the Political Reform tabled by the transition government led by Adolfo Suárez (1932-2014) but did not really campaign. On 24 January 1977, a neo-fascist commando murdered five people in Atocha, Madrid, four lawyers members of the PCE included. More than 100,000 attended to their funeral in the first leftist demonstration after Franco's death. The murder, aimed at hindering the democratic transition, accelerated the legalization of the PCE. On 11 February 1977, the party presented a request of inscription on the Register of Associations, that is, of legalization. This was granted on 9 April 1977. 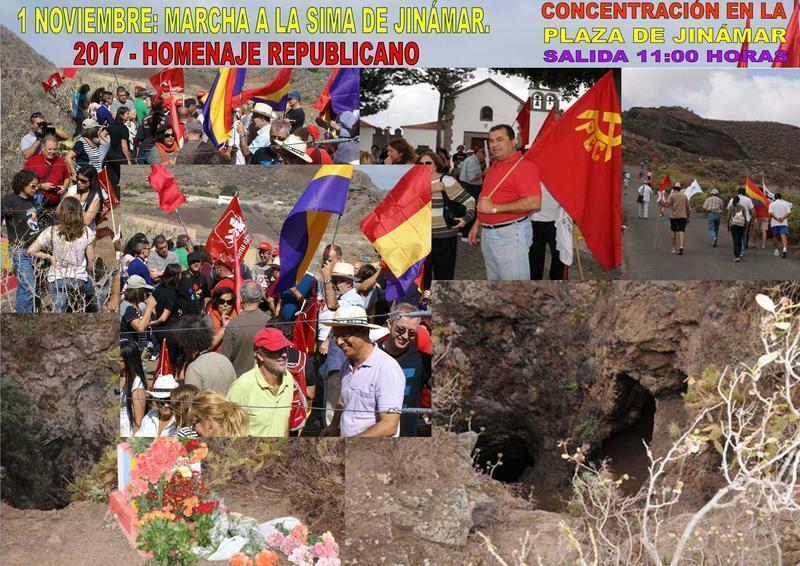 On 15 April, the Central Committee of the PCE reluctantly validated Suárez' conditions, which had been privately accepted by Carrillo on 27 February: the party recognized the red-yellow-red flag as the national flag, the monarchy and the unity of Spain. As anticipated by Suárez, the PCE obtained only 9.2% of the votes in the first democratic elections held in 1977 and only 20 representatives, eight of them were elected in Catalonia, where the local branch of the PCE got twice more votes. Dolores Ibárruri, the only representative from the 1936 Parliament re-elected in 1977, was welcomed by the President of the Parliament, Fernando Álvarez de Miranda (1924-2016), with the famous address: "Welcome Home, Madam". In the next general elections, held in March 1979, the PCE obtained three more representatives; in the municipal elections held the next month, the party gained the municipality of Córdoba. The Mayor, Julio Anguita (b. 1941), was nicknamed the Red Caliph. During the assault of the Parliament on 23 February 1981 by Colonel Antonio Tejero (b. 1932), Carrillo refused to obey the insurgents who had ordered the representatives to lay down; he was the only one who kept sitting, while the Prime Minister, Adolfo Suárez, and the first Vice President of the Government, General Manuel Gutiérrez Mellado (1912-1995), ordered the soldiers to surrender, to no avail (until the pathetic failure of the coup). Crises broke out in the Catalan and Basque branches of the PCE, while a renovating movement emerged. In the general elections of November 1982, the PCE obtained only 3.8% of the votes and four representatives, which caused Carrillo'(s resigning. Accordingly, the PCE, led by Julio Anguita, quit entering elections under its proper banner; the Izquierda Unida (IU - United Left) coalition, founded in 1986, was subsequently transformed into a party. The PCE could obtain only one seat at the Parliament after the last general elections, held on 27 June 2016. The economist Alberto Garzón (b. 1985), first elected in 2011 (Málaga) and re-elected in 2015 (Málaga) and 2016 (Madrid), is member of the Unidos-Podemos (PODEMOS-IU-Equo-CLIAS) parliamentary group. Before the Civil War, the PCE used the Soviet flag, as the Spanish branch of the Comintern. During its illegal / clandestine period, the party most probably used no flag at all. The modern emblems of the PCE are prescribed in Article 3 of the party's Statutes (text), last amended during the 19th Congress of the party, held on 15 to 17 November 2013. 1. The PCE uses as its symbol the red flag with the [yellow] hammer and sickle. 2. Its monogram is as follows [drawing of the monogram, made of yellow hammer and sickle (but no star) and the letters "PCE" lining the lower edge of the sickle]. The different representations of this anagram are compiled in the Handbook of Graphic Identity of the Federal Committee. 3. In events the red flag shall be used with the flag of the Republic. In most flags (photo, photo, photo, photo, photo), the emblem is placed in canton. On some flags (photo), the emblem is placed in the center. The Partido Comunista de Andalucía (PCA) held its Constituent Congress on 14-16 December 1979 in Torremolinos. As a component of the PCE, the PCA contributes to the elaboration of its general policy, applies it in Andalusia, and is granted full autonomy for the elaboration of the Andalusian policy. The flag of the PCA (photo) is red with the emblem of the PCE framed by a thin yellow rectangle; beneath, a cartouche is inscribed with "ANDALUCIA" in yellow letters. The flag is also used with the emblem in canton, above the writing "ANDALUCIA" (photo, photo). The flag of the PCC (photo, photo, photo) is red with the emblem of the PCC in the center. The emblem is similar to the emblem of the PCE, with the lettering "PCC". The Partido Comunista de Euskadi - Euskadiko Partido Komunista (PCE - EPK - Communist Party of the Basque Country) is the federation of the PCE for the Basque Country and Navarra. Due to the national characteristics of the Basque Country [here, Navarra included], the PCE-EPK elaborates and applies its program in an autonomous way, in complete concordance with that of the PCE. The flag of the PCE - EPK (photo, photo, photo, photo, photo, photo, photo) is red with the party's emblem, as prescribed in Article 5 of the party's Statutes, in canton, made of a hammer and sickle (but no star) and the letter "PCE" lining the lower edge of the sickle, and the letters "PCE-EPK" added beneath, separated from the PCE emblem by a yellow horizontal outline. The flag of the PCG (photo) is red with the emblem of the PCG in the center. The emblem is similar to the emblem of the PCE, with the lettering "PCG". TThe flag of the PCPV (photo) is red with the party's yellow emblem, similar to the emblem of PCE but with the lettering "PCPV" and completed in the upper left part to form a square by four diagonal yellow stripes. 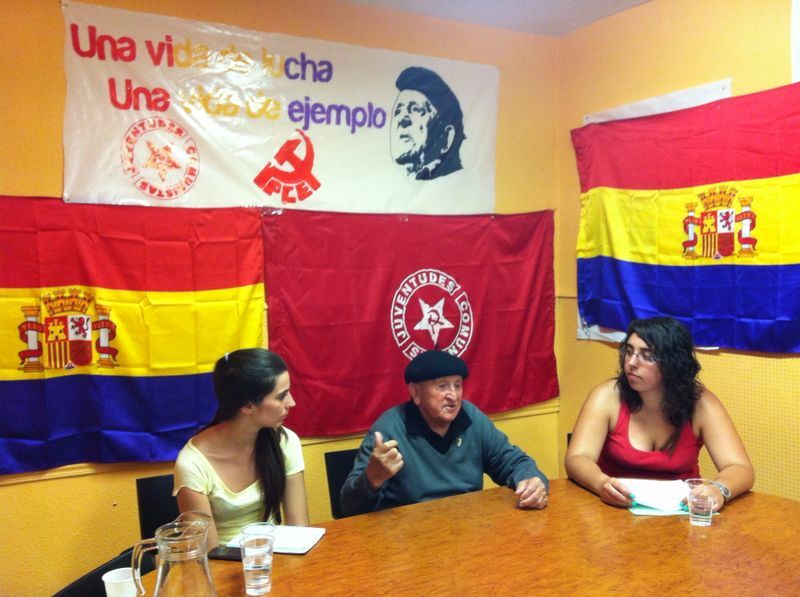 The Unión de Juventudes Comunistas de España (UJCE - Union of Communist Youth of Spain), usually known as Juventudes Comunistas (JC - Communist Youth) is the youth organization of the PCE. The flag of the UJCE (photo, photo, photo, photo, photo, photo, photo) is red with the organization's emblem in the center.